THE REVEREND John Brackenridge, minister of First Lisburn Presbyterian Church since November 2002, has been elected as the new Moderator of Dromore Presbytery at a Presbytery Meeting in First Lisburn Presbyterian Church on Tuesday evening (February 2). 2 in succession to the Rev Howard Gilpin, minister of Moira Presbyterian. 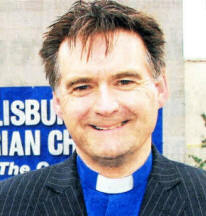 The Clerk of Presbytery is the Rev John Davey, minister of Hillsborough Presbyterian Church. First Dromara, First Dromore, First Lisburn, Harmony Hill - Lambeg, Hillhall, Hillsborough, Legacurry, Loughaghery, Magheragall, Maze, Moira, Railway Street -Lisburn, Second Dromara, Sloan Street -Lisburn and St Columba's - Lisburn. The congregations of Anahilt, Drumlough and Second Dromara are currently without a minister.